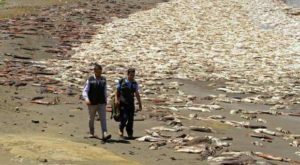 FUKUSHIMA SCIENTISTS ARE SAYING : THE DAYS OF EATING FISH FROM THE OCEAN IS OVER. Radiation from the Fukushima power plant is still dripping into the ocean. Well, it is not only dripping in to the ocean. There are several thousand gallons draining in to the ocean every day. And – – in the summer, the water is warm, and evaporates. The vaporized water is full of Radio active particles, and it drifts across the ocean to Alaska – Canada – the USA and often down to Mexico. Looking at this, I recommend you check out the facts for yourself, and you will know what to do. 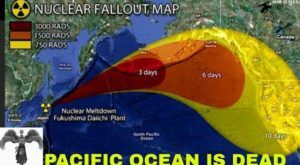 Kishner has declared that TEPCO, the business who supervises of monitoring the plant, has confessed radiation has been leaking into the Pacific Ocean for the past six years. He also claimed there is an estimated 300 to 450 storage tanks of infected Radio active water at the Fukushima plant. Many of the tanks are now starting to leak, and they do not know what to do with it. There is too much radiation for people to work with it. Who ever will work on it, has very little chance of survival. AAGE NOST STEPPING OUT OF THE BOX WITH RADIO HOST: "DR. J"